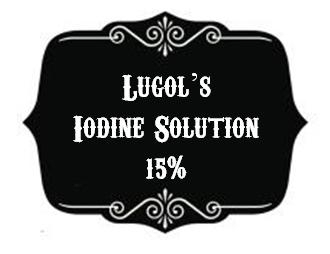 This is for 1oz of 15% Lugol's Iodine Solution that has been infused with Dead Sea Salt. Any version of salt can be iodized or non-iodized. In the United States, iodized salt was introduced into the marketplace in the early 1920's in an effort to help lower the incidence of goiter. Goiter is a condition in which the thyroid gland enlarges to try and maintain its optimal function, and one possible cause of goiter is dietary iodine deficiency. The way salt is iodized is usually very simple and involves the addition of an iodine-containing mineral salt (like potassium iodide) to the sodium chloride. Sea salt, kosher salt, and regular table salt can all be purchased in iodized or non-iodized versions. The problem with iodized salt is that there's .001% iodine. So while you're getting the bare minimun, enough to prevent goiters, we still need a whole lot more iodine than we're getting. This is what let me to supplementing iodine with Lugol's Solution. Iodine pushes out the flouride, even in the pineal gland, so it really helps wake one up per say. After noticing all the great benefits I started making my own. Making Lugol's Solution is a real simple process. All you need to do is take distilled water and mix in postassium iodide (KI), and iodine crystals. The key is to use 2:1 potassium iodide powder to iodine crystals. So for me I used 50g of potassium iodine powder and 25g of iodine crystals in a quart of distilled water. I then added Dead Sea Salt to that Lugol's Solution and let it soak in for a day while sitting in my Orgonite M.E.O.W.Kettle. I then filtered the salt from the solution and now I have 5% Lugol's Iodine Solution that has been infused with Dead Sea Salt. Lugol's Iodine, also known as Lugol's Solution, first made in 1829, is a solution of elemental iodine and potassium iodide in water, named after the French physician J.G.A. Lugol. Lugol's iodine solution is often used as an antiseptic and disinfectant, for emergency disinfection of drinking water, and as a reagent for starch detection in routine laboratory and medical tests. These uses are possible since the solution is a source of effectively free elemental iodine, which is readily generated from the equilibration between elemental iodine molecules and triiodide ion in the solution. Lugol's Solution has been used more rarely to replenish iodine deficiency. Likewise, in the Chernobyl disaster some Lugol's solution was used as an emergency source of iodide to block radioactive iodine uptake, simply because it was widely available as a drinking water decontaminant, and pure potassium iodide without iodine (the preferred agent) was not available. Most Lugol's Solution you can buy is 2%. I made this myself so I made it stronger at 15% so you only need a drop or two a day to get everything you need. The 15% is made by adding 50g of 99.99% pure ACS grade (highest available above food grade) Iodine crystals and 100g 99.99% pure ACS grade potassium iodide into 1 Liter of distilled water. Edgar Cayce stated that there were four elements needed to sustain life; Water, Salt, Soda and Iodine. Combining all 4 together makes this an ideal elixir to enrich your life and vitality. So if one were to take this Iodized Dead Sea Salt and add equal amount of Washing Soda to some water, you can make some Potent Ormus. “Of all the elements known so far to be essential for human health, iodine is the most misunderstood and the most feared. Yet, iodine is the safest of all the essential trace elements, being the only one that can be administered safely for long periods of time to large numbers of patients in daily amounts as high as 100,000 times the RDA. However, this safety record only applies to inorganic, nonradioactive forms of iodine. Some organic iodine containing drugs are extremely toxic and prescribed by physicians. The severe side effects of these drugs are blamed on inorganic iodine although studies have clearly demonstrated that it is the whole molecule that is toxic, not the iodine released from it." 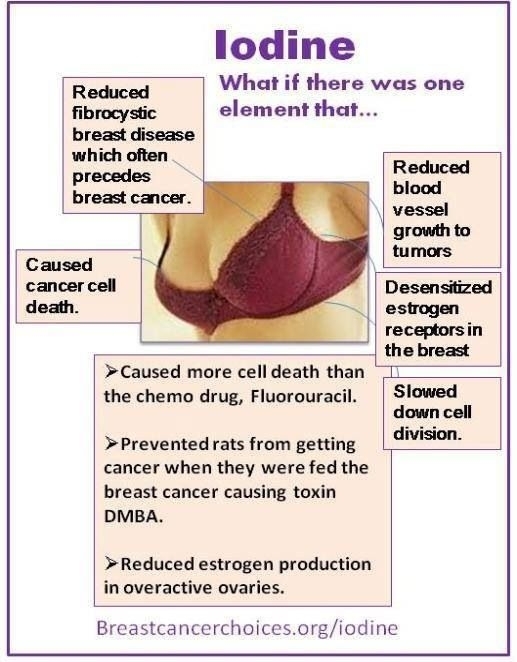 Iodine’s role in helping to prevent and treat cancer needs much more exploration and research, but there is suggestive evidence that it plays a role in preventing and/or treating cancer (especially involving the thyroid gland, breasts, prostate, ovaries and uterus). Max Gerson MD, whose successful alternative therapy involved using fresh vegetable juices and intensive detoxification, recommended iodine containing Lugol’s solution for all of his cancer patients. Iodine insufficiency problems are aggravated by our use of agents that interfere with the utilization of iodine (sometimes called goitrogens because they may cause an enlargement of the thyroid gland). These include the halogens (class of chemicals to which iodine belongs) fluoride, bromine and bromides, and chlorine. Fluoride, added to 50% of the U.S. water supplies, is also present in most toothpastes, and is used in fluoride dental treatments for children. It is also present in many processed foods and beverages. Fluoride can interfere with iodine utilization. For more information about fluoride, check out the article “The Dangers of Fluoride and Fluoridation” on our website. Bromine replaced iodine in most baked goods in the 1980’s because of the concern that iodine might be toxic. In fact, it is the bromine that is toxic and which can also interfere with iodine utilization. Bromine is also used to clean hot tubs and is present in many medications. Chlorine, used to treat swimming pools and present in many of the public drinking water supplies, also interferes with iodine levels in the body. Safer water purification systems, like ozone and iodine, itself, exist, but are currently not widely used. Iodine has been clinically proven to increase the removal of sodium fluoride from the body via the urine as calcium fluoride. Most diets are deficient in this vital mineral and it is recommended that people take seaweed foods and iodine supplements that combine iodine and potassium iodide. Fluoride from your tap water settles into the pineal gland. 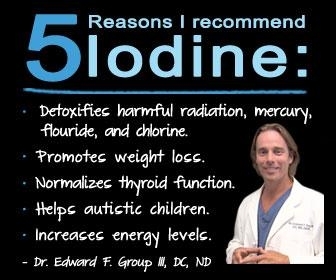 Iodine is essential to every organ of the body, but modern iodine deficiencies leave room for iodine’s elemental cousin, fluoride, to take its place. The human body has no use for fluoride so the body isolates it in a calcium husk. Increase your iodine intake and you’ll reduce the effect of fluoride on all of your organs.